While the recent news about carbon has been touted as something that can drastically improve the overall performance of the flooded lead acid battery, the facts should be completely understood before buying these types of batteries with any carbon additives, especially if they are sold as a value added feature. What we can expect to see is a gradual transition of solar from an alternative energy to a truly cost competitive source of energy that helps counteract rising electricity rates and fuel costs. The report identifies the "Top 5 Fuel Cell States" - California, Connecticut, New York, Ohio, and South Carolina. Next up at the plate as a hot, receptive market for energy storage in North America is New York. More than 88 megawatts (MW) of stationary fuel cells have been installed or ordered by U.S. businesses and utilities. One half of the VOTO is a fuel cell and the second half is a handle which has a light, cell phone adapter and nickel-metal hydride battery to store energy. Imagine a photovoltaic cell or module that actually stores as well as produces energy, acting as a battery and producing power even after dark. Will You Survive Solar Grid Parity? 08/30/13, 08:23 AM | Energy Storage & Grids | Energy Storage, ultracapacitors | Maxwell Technologies, Inc. In general, ultracapacitors are great solutions whenever the power demand is high, but the duration is short. For example, we are expanding into the diesel truck market, where the high power demand of engine starting can place a great strain on the batteries, greatly lowering their useful life. 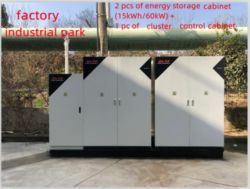 Using battery-based off-grid technology, a smarter type of "grid/hybrid" inverter technology is able to use PV, wind, hydro-electric and other renewable DC energy sources to keep the batteries charged and sell the excess to the grid, just like the grid-tied unit using the grid as its battery.